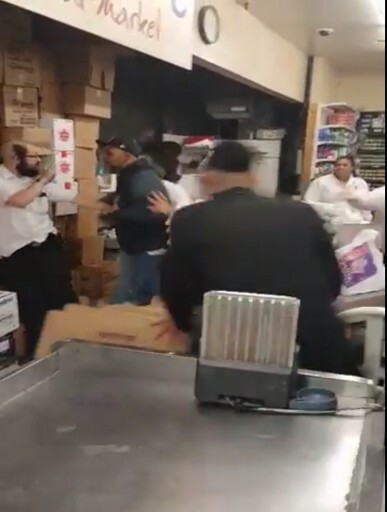 Brooklyn, NY - It was anything but business as usual at a Williamsburg grocery store last Thursday night, when a request by managers, who asked an allegedly disruptive customer to leave the premises, escalated into violence and culminated with three arrests. Police said that the incident took place on June 9th at approximately 10 PM at Central Market, located on Division Avenue. A 24 year old woman whose young cousin had been riding a hoverboard in the store was asked to leave the premises. Julissa Soto later told police that she was tackled to the ground by one Chasidic store manager and struck in the face by a flying peach hurled at her by another. Police said that the woman, who was wearing glasses at the time of the incident, sustained swelling to both her shoulder and her face and a laceration to her face. The woman returned to Central Market shortly thereafter with her father, who was captured on store video punching one of the managers in the face several times before police arrived on scene. Police arrested the two managers, 29 year old Matis Edelstein and 21 year old Abraham Spielman, as well as the father, 41 year old James Soto. All three were charged with assault. Spielman, who allegedly tackled the woman, and Soto were both released with desk appearance tickets. Edelstein, who allegedly threw the peach, was sent to Central Booking, prompting angry responses from community members who felt that Edelstein was treated unfairly and should not have received any jail time. An unnamed police source told VIN News that Edelstein’s more severe charges were due to the nuances of penal law, which distinguishes between hitting someone with your hand or another object. The unnamed source said that while Edelstein’s incarceration may have seemed unjust, it was dictated by the law. The source also noted the store managers, the woman and her father, all acted inappropriately. In a video interview this morning, the store manager disputed the woman’s account of events, saying that she had been in the store with several children and, upset that they were asked to leave the premises, the group went outside and started a full scale peach fight, using fruit from an outdoor display. The manager said that Edelstein and Spielman were indoors when the fruit fight took place but that when police arrived on scene, the woman randomly identified them as being responsible for her injuries. You don't ride hoverboards in stores. Also, Yidden, don't allow your "cute" child to coast around supermarkets on raizers. One of them hit my foot while I was shopping in a kosher supermarket on Coney Island Avenue last Erev Shabbos. Is there any proof on who did what? Or it was just a he said she said? 1) This guy (James Soto) is punching and screaming I am going to kill you at the two Jewish managers. And unbelievable that the NYPD had the nerve afterwards to falsely arrest and book the two Jewish managers overnight? The NYPD is trying to take revenge of the Jewish community thanks to the corruption scandal of Reichberg and Rechnitz!!! Before this NYPD scandal the 90 precinct police department with Shomrim were able to work out a deal between both parties to encourage both sides to drop the charges. 2) Soto's brother is a former NYPD officer; this is a real corruption from the inner NYPD. Looks like the Pomegranate 50% off sale. Isn't it assur to throw food? Don't you see the video? “ 1) This guy (James Soto) is punching and screaming I am going to kill you at the two Jewish managers. And unbelievable that the NYPD had the nerve afterwards to falsely arrest and book the two Jewish managers overnight? Looks like a family of con artists looking to sue. Thankfully this video will show the world what type of people this family is. James Soto should be im-peached! Exactly. And by the way this article till the end claims the side of the story from that big monster with the cap and at the end they throw in the Jewish store owners side of the story. Shame on you. Is there and video from the store so i can see who punched whom? Problem is we used to have community leaders who acted as liaisons with the NYPD. Now there is no leadership in the Williamsburg community. When we needed assistance with the pool issue, Dov Hikind (Boro Park) took care of it. Shame!! What happened, all liaison chaplains busy facing corruption investigations from the FBI to pressure the cops to not even file a report like they could in the past? What are black people looking for in a kosher grocery in any case?? I worked at the 90th Precinct in 1969, as a civilian employee. I witnessed anti-semitism first hand, by the patrol cops, against the Chassidic residents. There was a fight one night, between the Chassidim and the Hispanic residents. The cops rounded up a number of Chassidim and charged them with assault. Fortunately, the Captain of the 90th Precinct at that time was Jewish, and the charges were dropped. However, a few Irish detectives were not happy, and berated me with the fact that the charges were dropped, because those charged were Jewish. I mentioned that to the Captain, and he stated that he was glad that he had the charges dropped. He was a proud Jew! Also, I heard some cops state that "Hitler didn't kill enough Jews". I told the Captain about that remark, also. In addition, one idiotic cop actually told me that "Hitler didn't kill all of the Jews, only the Chassidim". The only thing that I enjoyed during my brief tenure at the 90th Precinct, was the wonderful kosher restaurant nearby; unfortunately, I forgot the name of it. The old 90th Precinct was on Lee and Division Avenue. How embarrassing that the entire store couldn't beat the c*** of that antisemite who was hitting the managers! Where were the alleged "shomrim"? Maybe it's time for "Shmirah" in Willi! The man was accompanied by what looked like a harem of three or four wild hippopotami. It would be hard to knock down over 1,000 pounds of wild animals.